Strawberry Ninja is a cooperative hidden sliding puzzle game created by Chris Castagnetto and beautifully illustrated by Magdalena Markowska. Inside the strawberry patch the ninja hides, and the players must find him and direct the cat to catch him! 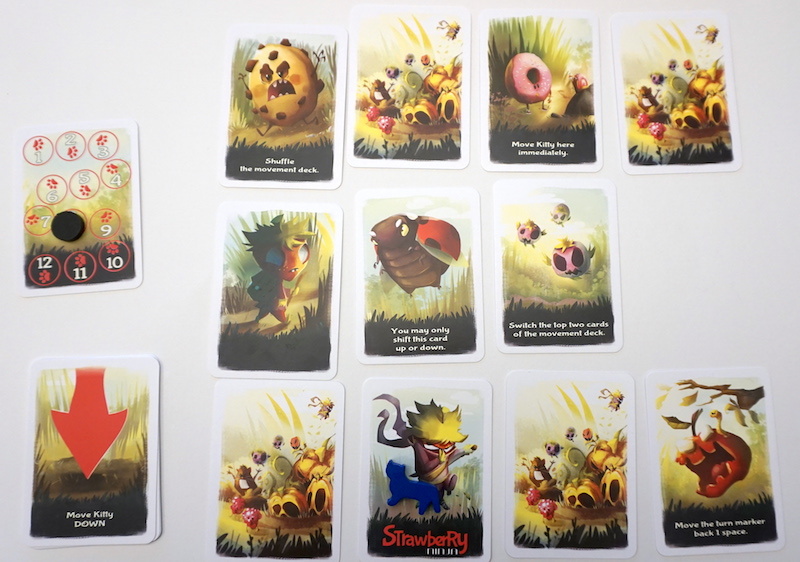 The game begins by choosing 10 of the 21 cards in the deck to create the strawberry patch. Players can be choose these specifically or randomly. They then add the Strawberry Ninja card, shuffle, and lay the cards out face down in a 3×4 grid with one random blank spot. Each player begins their turn with shifting two cards in the 3 card by 4 card grid. Then, they flip the second card moved, if it’s face down, and do whatever the card says. Next, they flip over the next movement card to find what direction to move the cat. Finally, they advance the turn marker on the turn track. The goal is to find the Strawberry Ninja and have the cat land on him in less than 12 turns! Strawberry Ninja is a very simple game with straightforward rules that are very easy to understand. There is a some logic at play with navigating the cat around to the unknown patch cards should the ninja appear. It isn’t hard, but players can drop the turn threshold as low as desired to up the difficulty. What’s Up is a memory/logic game from the minds of Dennis Kirps and Jean-Claude Pellin, once again illustrated by Magdalena Markowska. What’s Up consists of just 30 double-sided cards laid out in a 5×6 grid. On each players turn they turn a single card over. If that card fits their collection, the player adds it to their collection in front of them. 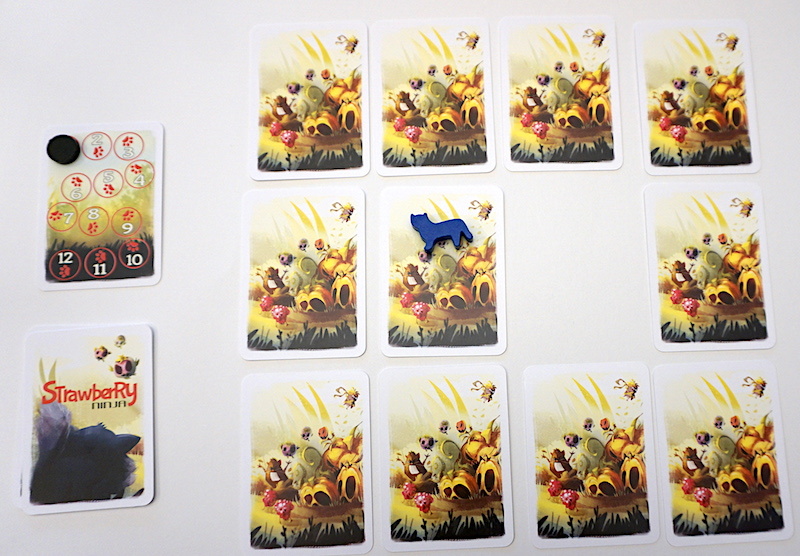 Each player’s collection consists of rows of birds of each of the four colors on the board. 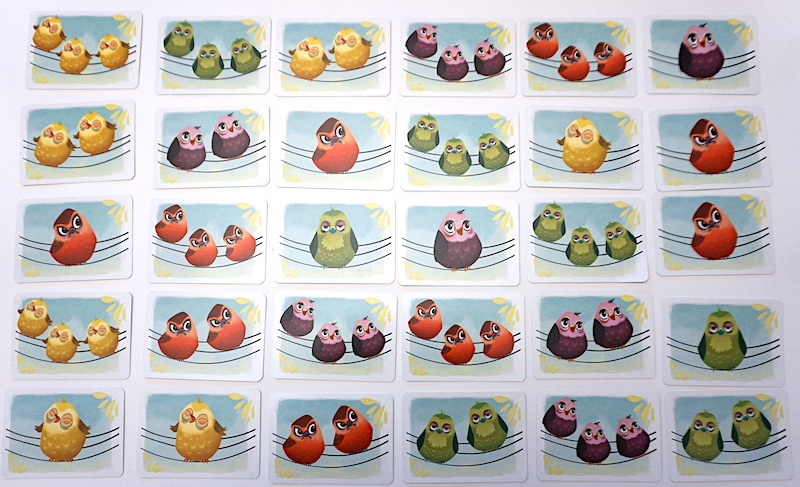 Each row can contain three bird cards, beginning with one bird and climbing to three. So, a player that has a red single bird, a red double bird, and a yellow single bird in their collection would want a single purple bird, a single green bird, a double yellow bird, or a triple red bird. A player cannot begin a second row of cards in a color they already have a row for. Both Strawberry Ninja and What’s Up do an excellent job capturing the “small game, quick to learn and teach” essence that drives Strawberry Studio. Both of these games are very easy for kids to learn, with the logic of Strawberry Ninja slightly more difficult because it involves managing two moving parts (the shifting of the cards and the movement of the cat) in concert for the end goal. We love how the games feel like fully fleshed out games although they are small and quick. Stored for travel, both of these games together take up barely any space. In fact, the container pictured is holding *both* games. The art is catchy and the gameplay is so simple any observer will pick it up very quickly. Although Strawberry Ninja is slightly more complex in terms of mechanics, it definitely feels like a “solvable” game. Players that can manage the systematic flipping of unknown cards and positioning the cat accordingly will find it fairly straightforward. Adjusting the turn rules will be critical to making it a consistently challenging experience. 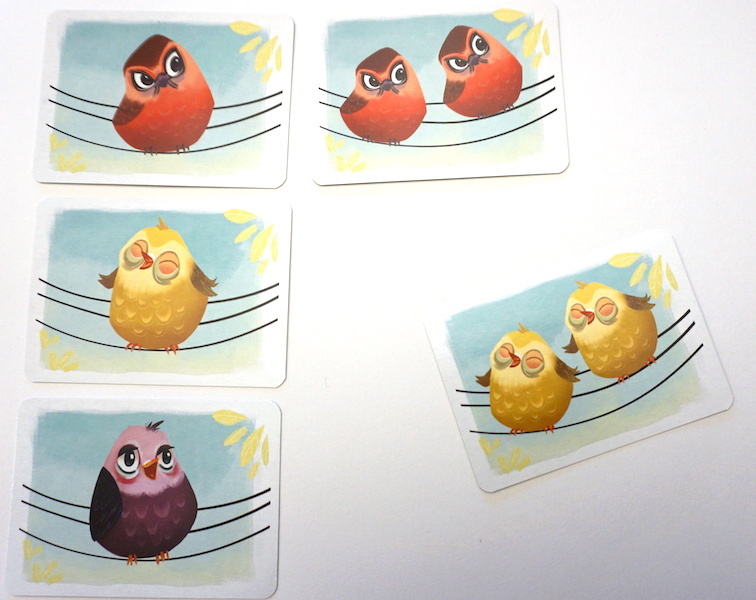 What’s Up, on the other hand, is a refreshing memory/logic race to complete your bird set. It is a fantastic palate cleanser and players can use it to teach logical deduction. Between the two we give the edge to What’s Up, but both are fun, whimsical, family friendly, and quick. You can find What’s Up on Amazon for just 10 bucks. 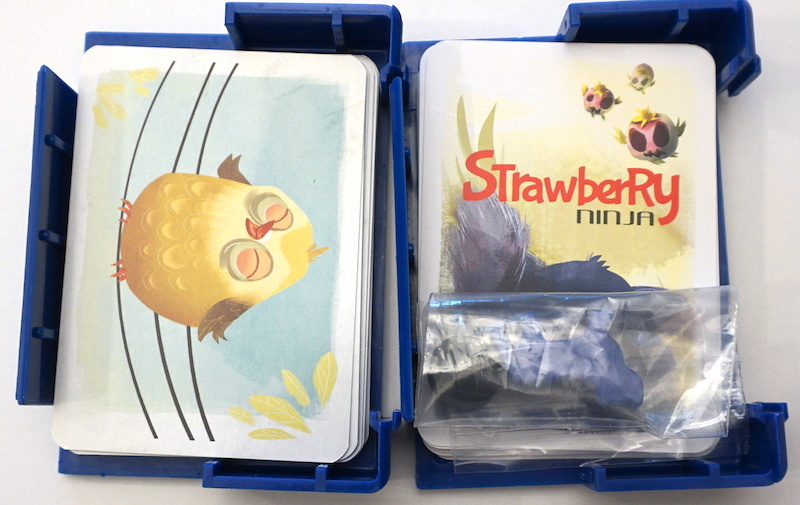 Strawberry Ninja was just released and isn’t yet available in the Strawberry Studio Store, but will be soon.